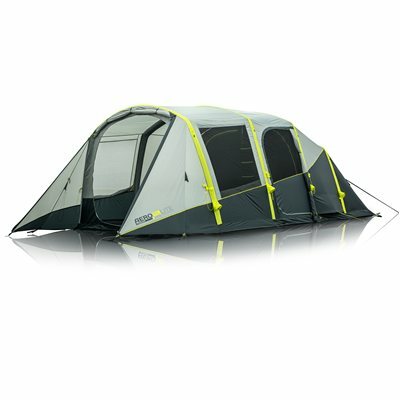 The Aero TL Lite features full head height throughout the tent. The peak height of 2.25m creates a feeling of space inside the tent and provides unrestricted access to all parts of the living area. The extra tall inner tent height of 2.05m ensures easy access in and out of the bedrooms. The lower wall height of the bedrooms increase the stability of the tent and reduces exposure to strong winds. The front awning area has a minimum head height of 1.9m. Angled pole corners further increase the useable space on each side of the awning. A large double zippered door allows the front awning to be used as a wet storage area. The front door can be poled out with an optional awning pole set to create a large shaded area in front of the tent and the ground area can be covered with an optional ground sheet creating a more protected space. The door into the main living area is a 360 door which can be unzipped entirely and folded away neatly into a storage pocket. The top of the door features a mesh panel with internal cover allowing you to control both ventilation a privacy within the living area. Central toggles also allow the door to be rolled back half way to provide more privacy. Inside the living area, a fully sewn-in floor creates complete protection in all weather. Mesh windows on either side with internal covers allow airflow from one side of the tent to the other. A twin layer side door provides an additional entry / exit into the living area. Angled poles also create full head high throughout the tent. The rear sleeping area is constructed from blackout fabric to provide protection from the early morning sun. Bright coloured zips and lantern rings are easy to find in the darker environment. The sleeping area can be divided into two rooms with a roll away toggled wall and twin doors providing individual access into either room. A larger room on one side creates additional space for a couple and a smaller room is ideal for kids or a single adult. A series of pockets located between the rooms allow multiple storage options for small items and lower pockets beside the sleeping area provide easy access storage from your mat or stretcher.